We have looked at the principles of design thinking, and new frontiers for design practice. Design thinking can be applied to lots of different types of problems, such as designing a life you love, designing your career, designing a new product or service, or improving new or existing business processes. This week we are going to learn how to apply design thinking to a problem of your choice. Is there something that happens in your organization that you feel can be improved? What can be done better? STEP 1: Begin with a question: The design process kicks off with an open ended question. For example, how might we improve the on-boarding experience of new staff, or how might we attract design talent, or how might we streamline commission processes for sales staff. Lets consider a question a telecommunications provider might ask; how might we improve ordering and activation of complex IT products (e.g. data and networking infrastructure) for medium (100-1000 staff) business clients? STEP 2: Explicate assumptions: Incorrect assumptions can thwart innovation as it leads to solving the wrong problem. At the beginning of a design thinking process it is useful to consider what assumptions are currently being held about the problem space. Talk to people within your organization to uncover what they think they know about the problem and customers? For the telecommunications question, some assumptions could be that companies have dedicated internal IT resources that are knowledgeable about available telecommunications products. Companies outsource complex network design to external consultants. Companies have dedicated finance teams who look after purchasing/invoicing etc. STEP 3: Do research with people in context: Check your assumptions in the real world. Talk to people. Observe. There are many research methods you can try to understand what the current state is. Establish which specific products you are going to look at. Are there differences in the types of companies that order these products? For example, differences for regional businesses vs. city based businesses, industry sectors, diverse understanding of the technical products by the organization. What characteristics differentiate the different types of businesses? This is important, as you want to make sure that you speak to a good cross-section of people representative of your market. Read some tips about conducting interviews. Next consider who in the organization is involved in the purchase of these products? For our example, how do staff currently order and activate products? How do they learn about them? What happens during the purchase and activation phase? Define the whole customer experience from awareness of the product, to research to decision, to ordering, to purchase, to installation and activation, to renewal and/or upgrading. Get lots of different perspectives and then look for patterns in your data. Affinity diagraming provides a valuable methodology for data analysis. To do this you write things that you have heard or observed on post-it notes. One point per post-it note and you look for relationships between the ideas and group related post-it notes together. For the telecommunications question the stakeholders involved in ordering and activation for the telecommunications company includes; customer care call centre staff, sales staff, technicians, finance staff. For the businesses the people involved included IT managers and their staff, finance staff, and executives (as decision makers about expenditure). Interviews can be conducted with representatives of these different user types. Make sure that you include questions that help you validate or challenge the assumptions that you uncovered in step 1. By sharing stories about the worlds of real customers you can support your colleagues to make more customer-focused decisions. After conducting research an affinity diagramming process could be used to consider the data. It is best to do this in a meeting room that you have access to over a few days. It can be useful to think about the data in relation to the customer journey, considering what happens during the awareness process, through to purchase, installation and billing. 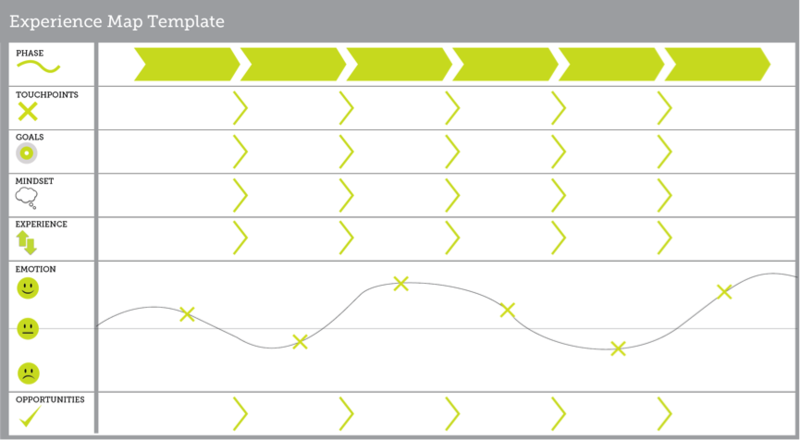 STEP 4: Define frameworks: A valuable part of design thinking is visualization. Create some models as tools to think with. Personas and journey maps provide useful tools for visualizing service interactions, needs and opportunities. Below you will find some example frameworks that could be used for the telecommunications case. You can use these to consider data from your own interviews. The phases for the telecommunications example could be: awareness, learn/research, order, purchase, install and activate, billing, upgrade. The touch-points could be TV, word-of-mouth, web, direct mail, phone, in-store. Goals for the awareness phase could be to understand what suppliers exist, for the learn phase, to understand our businesses requirements and learn what products meet our needs. Mindset shows what the person is thinking at the different times. Experience shows what they are doing/experiencing. Emotion shows how they felt at different stages. Opportunities show what would make it better. 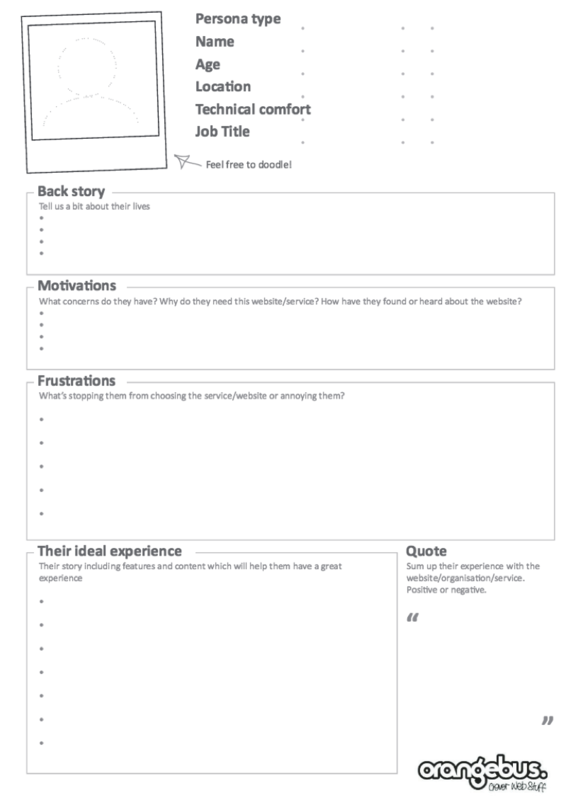 Fill in these templates with information that you learn about your customers. These frameworks can bubble up opportunities for improvement. Work with your team to work out which opportunities you should focus your efforts on within the prototyping stage. Where will you get the most bang for your buck? STEP 5: Prototype interactions with people: Make some prototypes of your ideas and put them in front of people who may use the service. Get their feedback. Refine. Retest. Prototyping is a fundamental part of design thinking. Work with your team to come up with some ideas, or you could invite some of your customers in to ideate with you in a co-creation session. You can use different techniques to come up with improved service ideas. For example, role-play an improved future state, use lego or a paper-based images to step through how the service could be different. If the opportunity is a site or an ap. You could sketch interfaces and process flows for online interactions or mobile apps. Develop some lo-fidelity prototypes and get out and discuss them with customers. Refine them as you learn more and retest. It is a lot cheaper to test prototypes than spending a lot of money on getting something that customers do not want out to market.